One of the 2014 USDA/1890 Scholars Program recipients will be attending the College of Agriculture and Human Sciences (CAHS) at Prairie View this fall. Mr. Raymond Thomas is one of the most recent scholars to be accepted into the USDA/1890 Scholars Program, and he has chosen Prairie View A&M University as the 1890 institution at which he will pursue his education. The USDA/1890 Scholars Program offers scholarships to students who are seeking a bachelor’s degree at one of the eighteen 1890 Land-Grant Institutions in any field related to agriculture, food, natural resource sciences. Each award provides annual tuition, employment, and covers the costs of room and board, books, and fees through 4 academic years, plus a requirement to work in the Student Educational Employment Program, and is valued at $125,000. The scholarship is renewed annually, but renewal is contingent upon satisfactory performance and progress toward completing the degree plan. Upon receiving their bachelor’s degrees, USDA/1890 Scholars have an obligation of 1 year of service to the USDA for each year of financial support they have received. The USDA/1890 Scholars Program also includes opportunities for paid internships with the USDA in different cities throughout the 4 year scholarship period. Mr. Thomas is only the second USDA/1890 Scholar to attend PVAMU. He will be attending Prairie View in the fall of 2014 in CAHS majoring in agricultural economics. He chose to attend Prairie View mainly because his father attended and his older brother is also currently a student. He became more familiar with CAHS and the field of agriculture when he attended the 2013 REAP program where he also learned about the USDA/1890 Scholars Program. 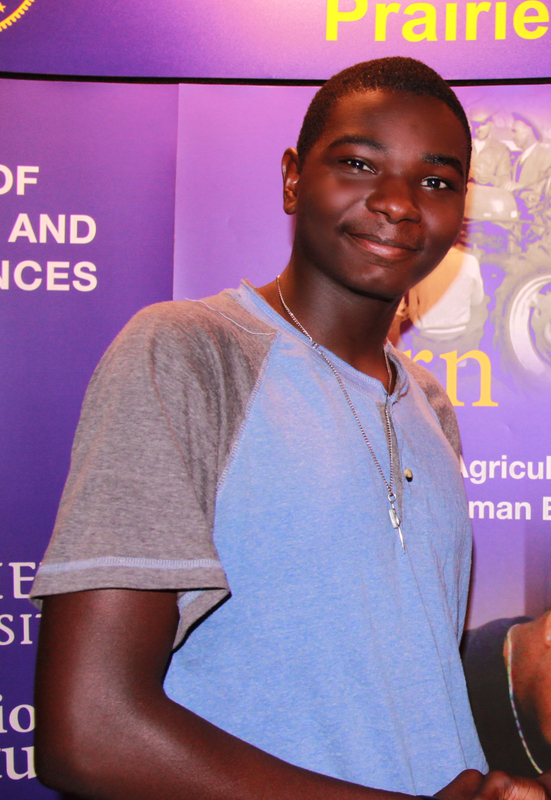 He has also received a $10,000 departmental scholarship through CAHS to supplement the USDA scholarship. Raymond is very excited about starting his college career. He has been interested in agriculture since he joined the Boy Scouts at around 5 years old. He remained an active member of the Boy Scouts throughout his primary and secondary education where he achieved the rank of Eagle Scout. Being a scout developed his interests and appreciation for the environment and agriculture through extensive outdoor camping. He chose PVAMU because of the close, family-like environment amongst the students, faculty, and staff. He also feels that Prairie View has the adequate resources and dedication to ensure his success earning his Bachelor’s degree. Raymond is interested in pursuing a career working for the National Agricultural Statistics Service (NASS) within the USDA upon graduation. With a career with NASS, he can satisfy his passion for agriculture with his passion for mathematics and crunching numbers. This entry was posted on Friday, August 1st, 2014 at 4:50 pm and is filed under College of Agriculture and Human Sciences. You can follow any responses to this entry through the RSS 2.0 feed. You can leave a response, or trackback from your own site.